As you settle in to the beginning of a new work week, here is something to ponder. The following article by Ferris Jabr which appeared in The New Yorker September 3rd, 2014 looks at the role walking has played in some popular English literature and how walking might just make us more productive thinkers. This, of course, will come as no surprise to walkers. Thanks to my son for the link. Why Walking Helps Us Think – The New Yorker. Ambulating on two legs dates back 3.6 million years ago according to anthropologists who have studied human like foot prints preserved in the volcanic ash in Laetoli, Tanzania. Those foot prints were discovered by anthropologist Mary Leakey in 1978. 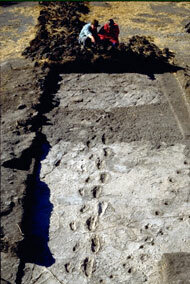 The Laetoli footprints, from http://www.getty.edu, photo-Martha Demas, 1995. The human like Austrolapithicenes who left those foot prints were quite possibly walking for a utilitarian purpose, like searching for food or shelter, or returning to their shelter. As our human society has evolved, however, walking has evolved right along with it. In fact, one could suggest that as a species, we have evolved to no longer need walking for distance travel. We walk now to thrive, not survive. Evening strolls, weekend hikes, backpacking trips, laps around the high school track. Humans continue to find new but non-essential ways to exploit the simple, elegant act of placing one foot in front the other. And that act, in fact, is one of the hallmarks of what it means to be human. Today, walking for long distance travel, on the other hand, has become rare. And this might explain why last month, when the Tougas family of New Richmond, Canada, announced their plans to walk more than two thousand miles, together, on the Appalachian Trail, they saw it as a viable marketing opportunity to raise money for their project. The Tougas family announced their planned family through-hike of the AT on Kickstarter.com. They received pledges of $19,109 (Canadian), surpassing their goal of $16,000. The family spokesperson and father, Damien Tougas, explains on his KickStarter site that the monies raised will go to fund production of a video series that sponsors will receive in installments, once a month. The money raised, he said, will not be used to pay for the hike itself. The family has already put aside funds for their 6 month sojourn, he explains. Walking has always been a sure mode of human transportation. Early humans of course had no alternative. Hunting and gathering required walking and beasts of burden had presumably not yet become part of daily life. Even Americans, thousands of years following hunter-gatherers, still walked alongside their covered wagons, for upwards of six months. 400,000 or so people migrated, on foot, westward to Oregon, Utah, New Mexico and California, between 1840 to almost 1870. Their wagons were so full of family belongings and food there was precious little room left for riders. But these hearty pioneers were perhaps among the last of the long-distance migratory walkers, at least in North America. Human beings have slowly, but persistently, sought out alternatives to walking. Even several thousand years ago, Egyptian soldiers used horses to pull their chariots. Some Greek warriors rode into battle on the backs of elephants and trade routes in the Middle East have domesticated the camel. In more recent times horses have either carried riders or pulled wagons and carriages. The horseless carriage morphed into the car, and now motorized transportation has become ubiquitous. Walking as a daily means of transportation has become a rarity, at least in western civilization. And while the Tougas’ get great credit for their planned family adventure, we are left with the question, why is watching another family walk intrinsically interesting? Certainly there are challenges and risks with a long distance hike and even more so for the younger Tougas children. The AT however, is well marked, well traveled and fairly close to civilization along most of the route. Although a 2,100 mile trek is big undertaking, and the trail is quite strenuous at times and weather is always a variable. Nonetheless, I suggest that our societal de-evolution of long distance walking is the key to family Tougas’ ability to raise close to twenty thousand dollars from 267 people who are willing to pay to see that family walk. Almost like paying to watch an IMAX movie about rock climbers, or cliff divers or base jumpers. In 2014, traveling a long distance on foot is a novelty and considered an adventure, only for the intrepid among us. And I suspect that even if family Tougas said they were going to walk strictly along back-country roads from Georgia to Maine and stay in bed and breakfasts along the way, and not pitch their tent in the woods, they still would have been able to raise money for their trip. In one week the Jewish people mark the exodus of the Children of Israel out of Egypt, when they began their forty year sojourn toward the Promised Land. 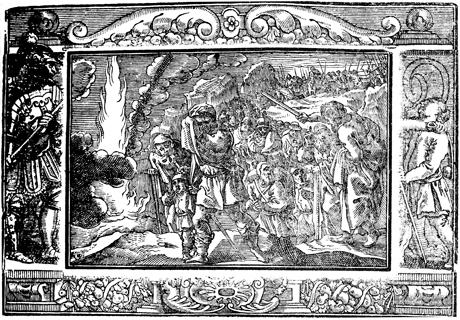 After hundreds of years of bitter enslavement the Israelites walked out of Egypt, away from their life of servitude, to follow Moses, a leader appointed by God. During four decades the Hebrew tribe walked from encampment to encampment in the Sinai peninsula, until they finally crossed the Jordan River to enter the city of Jericho in the land of Israel. Next week, when Jewish families gather to commemorate that night about four thousand years ago when the Israelite begin their long walk toward freedom, let us also remember that one of the most basic human functions, walking, is so simple and elegant. The long walk should not be considered a novelty, since the process of walking can transport us, physically and figuratively, toward a new beginning. 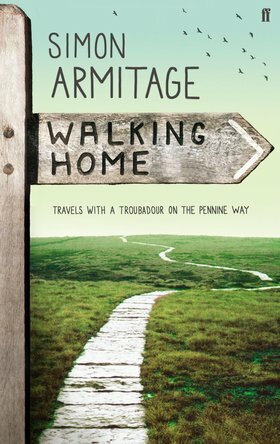 For walkers, trail runners, travelers and even armchair explorers, read about one man’s slow seven year walk retracing the route of human migration over millennia. Journalist Paul Slopek, partially funded by National Geographic, is making this journey and posting every several hundred miles with text, photos and even a short audio track of the sounds that surround him, wherever he may be, desert, town, market, or no where particular. In this article Slopek writes his first extended length article about this journey he began earlier this year, starting in Ethiopia. Now he has crossed the Red Sea and is walking north along the coast in Saudi Arabia. “Each step we take is an arrested plunge, a collapse averted, a disaster braked. In this way, to walk becomes an act of faith. We perform it daily: a two-beat miracle—an iambic teetering, a holding on and letting go. For the next seven years I will plummet across the world. via To Walk the World. I drive to work everyday. I look ahead, see I need to turn right and turn the wheel to the right. A pilot makes small adjustments to the yoke to change direction as does a boat captain to the wheel. And a cyclist, of course requires, well, the bike and its handlebars for steering. But hikers, walkers, runners – we look ahead, see the trail we want to take, and will ourselves toward our chosen direction. We look and our feet respond. A slight bend to the right, a hop across a creek, an off-trail trip up a hill through tall grass or over downed branches, roots and rocks. No wheel or yoke or handlebars required. Our eyes do the steering on the trail. Eyes see. The brain generates the course corrections. The feet loyally follow directions. Planning and navigating a route is indeed an intellectual endeavor. Following the path that lies ahead, however, is primal. It involves our core senses- the visual of course, our steering mechanism; the tactile-sensing the ground; the auditory-hearing our footfalls over leaves and twigs or the sound of splashing or crunching, say, hard-packed snow; and the aroma and taste of the outdoors. Now in the Fall the smell is of the denoument of fallen leaves, their final act before dissolving into forest floor. Pay close attention on your next trail. 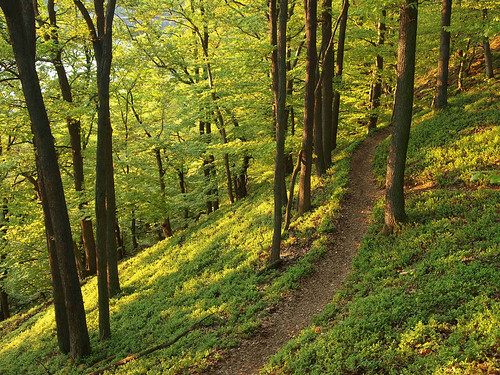 Choose a route, begin the journey and your body appears to simply follow the path. But the walk ahead is never simple: It may begin with just a vision, a vision though that evolves to engage all of your senses. Walking and running are solitary by design. Walk out the door. Keep walking, alone with your thoughts. 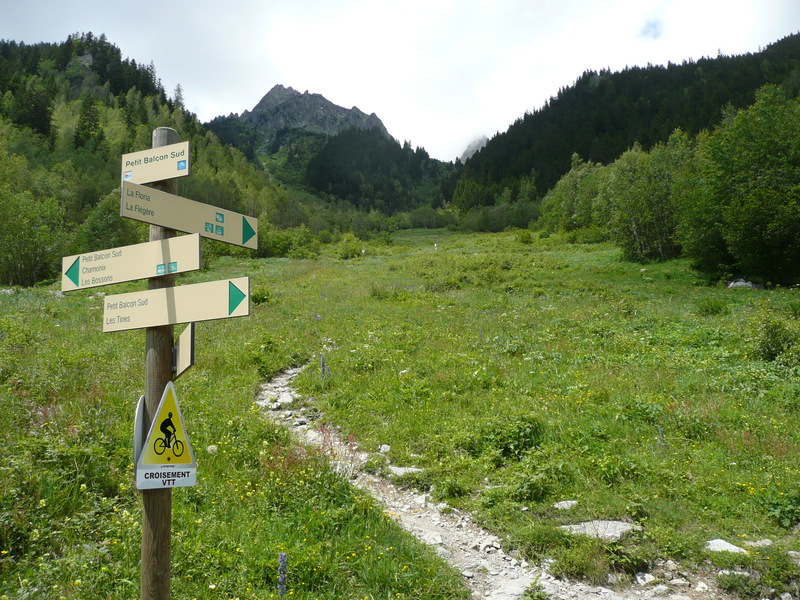 Continue running to the sound of breathing and footfalls on grass or dirt trails. 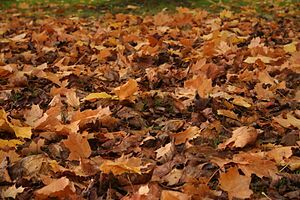 auditory (hearing crunches, crackles, snaps, as the soles of my shoes pulverized these leaves once green than brightly colored and now shades of brown). For the hill walker, trail walker and hiker, ‘hearing’ the trail is a rite of Autumn no less than observing the leaves’ quietly change from monochrome to their festive polychrome array. See it. Feel it on the ground. And hear it as you walk and run. The “fog of war” explains how otherwise civil men can be driven to act so uncivil. Fog is the rationale. Not only soldiers but poets too have turned their eyes toward the “fog”. For them it is a comfortable literary trope. “Fear death – to feel the fog in my throat and the mist in my face” wrote Sir Robert Browning (1812-1889). And when people look out their window and see the fog, they sigh as if only sunlight can bring happiness. Last Sunday I hiked a route with which I am quite familiar, a 4 mile trail through boulder fields, along and over brooks, past a cascading waterfall and around fallen trees in an east coast maple-beech-birch forest in northern New Jersey. The trail includes over 1000 feet in elevation change and half of that is a 500 foot ascent up a section with several vistas along the way. From each viewpoint the panorama gets better and better until at the top one can see 30 miles and easily make out the skyline of New York City. On a clear day people make their way up the strenuous section which is almost two miles from the trail head. 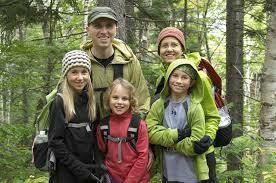 On a clear day a hiker will see others along the way and at the top, in small groups or large or alone with their dog. On a foggy, damp day you see no one at the top and just one or two souls who have turned around complaining about the absent views. But I for one saw value that day in not seeing. I took comfort in my obstructed view of that which I knew was there yet could not see. And for the first time in my life I made no effort to look past the slate gray cloud which enveloped the summit, which colored the nearby lime green leaves into a drab olive hue and totally hid the canopy only a few dozen feet beyond. No skyline was to be seen no how. I surrendered any attempt to see beyond my veiled misty curtain for I began to understand that the nature of nature is that it is always beautiful if not always comfortable. We are guests in a vast abode about which we have no say. Yes, I could have waited for a sunny day. 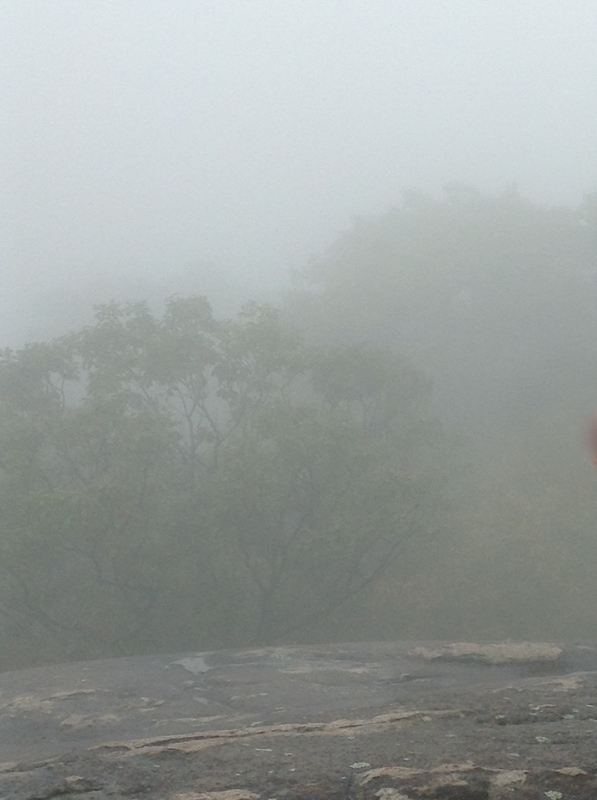 But Sunday last the fog at my fingertips was my panorama, and it was good. June is a month of gathering to watch people walk, in graduations, weddings and parades. This coming Sunday is the Puerto Rican Day Parade, one of the largest in New York City. Last week was the Israel Day Parade, also traveling up Manhattan’s Fifth Avenue. 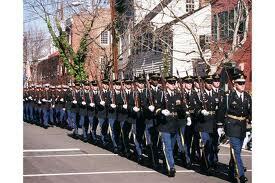 On Memorial Day small towns across America had parades and this will be repeated on the Fourth of July. Why we do we gather in large numbers to watch other people walk with flags and banners? Would we gather in the same numbers to watch people stand with flags and banners? People do not gather in large numbers to watch other people standing in protest. Yet we gather to watch a parade. Arguably, a parade has music and festive ‘floats’ which is enjoyable to see. But we also gather to watch our children march down the graduation aisle. And no doubt we would go to their graduation even if they did not march in to Pomp and Circumstance. And the same for weddings. We would definitely attend even if there was no ‘marching’, really walking, down the aisle. 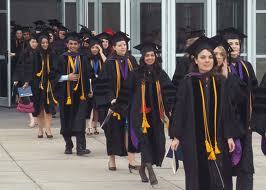 Yet intrinsic to the graduation and weddings is the walk down the aisle. We gather to watch people walk, to move, to transition from one stage of life to another. We gather to watch people walk en masse, in an organized manner that is a culmination, that required dedication and planning, that marks an accomplishment or a declaration of allegiance to a cause or an identity. We stand and observe while the people we care about move forward. Walking is after all the choreographed movement of temporarily losing than regaining one’s balance. We the observers stand and bear witness that people we care about or identify with have imposed balance and order in their lives in what at times is a world fast paced and often off-kilter. Walking around the world I would say is the ultimate way to use one’s feet. Walk through desert. Walk over mountain ranges. Walk through war zones. Walk through history, geography, geopolitics, anthropology, sociology. Walk through humankind. 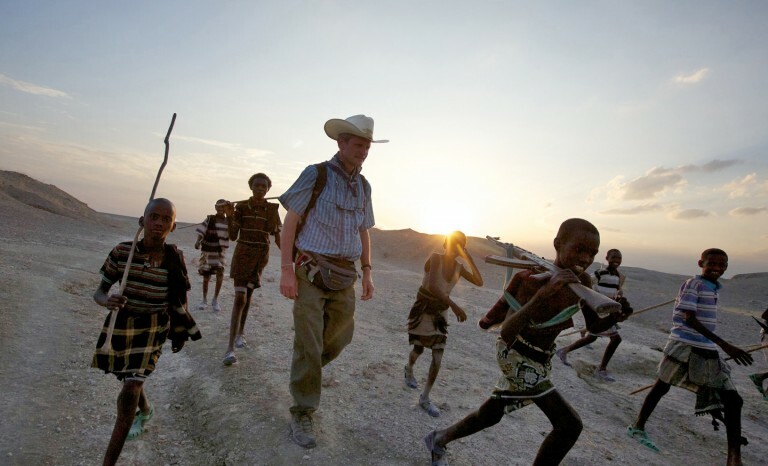 Paul Salopek, a Pulitzer Prize winning journalist has begun his trek Out of Eden, the name of his project by walking from his starting part along the great rift valley in Ethiopa. He is headed across Africa, the Middle East, Asia, across the Bearing Strait into Alaska and down the west coast of the United States to his ultimate destination, the southern tip of Chile. But Mr. Salopek’s destination is not ultimately one of mileage. Rather it is one of understanding human history, as it was and as it is today. Salopek is posting a ‘milestone’ on-line every 100 miles which consists of photos of the ground, sky and people and an audio recording of where he stands along with a blog post. His seven year journey will cover about 21,000 miles on this journey sponsored in part by National Geographic as well as news organizations including The Pulitzer Center on Crisis Reporting and the Nieman Foundation at Harvard.